Learn how Spocket can help you launch your business in less than 1-hour. You’ll need a Shopify store, luckily you can sign up for an 14-day free trial of Shopify right here. Once you’ve done that you’ll want to head over to the App store and install the Spocket app. Spocket allows you to find products from North America & Europe, add them to your shop with one-click, with no upfront cost. All your orders will be automatically fulfilled. Spocket suppliers are reliable, offer fast-shipping and high quality products; you can even find products from your home town. The two big thinkers, store name and store niche. What do you want to sell? What gets you excited? Have a quick think and decide on a few products. Once you’ve decided on a few potentials, we recommend using Google Trends to find which one has the most traffic surrounding it. At the top you can see 3 products we had in mind; Coconut oil, Essential oils and Matcha. 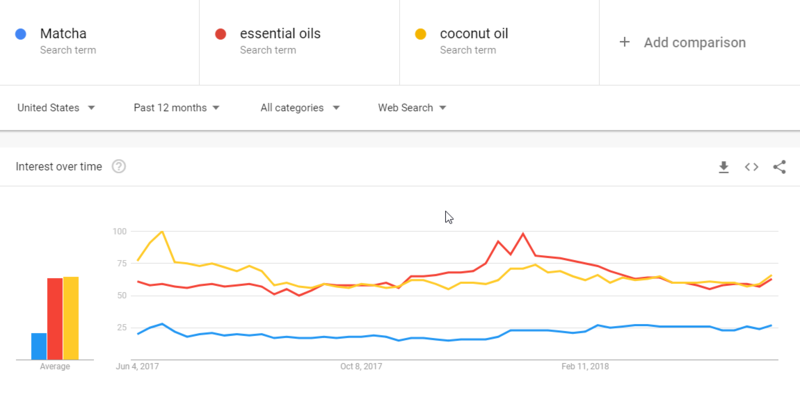 The graphed lines represent how popular these are, in this case we should choose between Essential oils or Coconut oil over Matcha on account of how popular these items are in comparison. A good tip to keep in mind is ensure the product you pick is on an upward trend, rather than a downward trend, you can see all of these items are spiking upward, that’s a good sign. So you’ve decided on your product. It is the time to find those products on the Spocket marketplace and easily import them with one click. Click on the “Add to import list” button for the products you want to push to your shop. Then head over to the list to make some last minute adjustments before sending the products on their way. Designing and tweaking. This is one of the more exciting steps, as you get to choose your theme and start making visual changes. The Shopify Theme Store has plenty of designs to choose from, you can purchase a theme or just choose from one of the many awesome free themes Shopify offers. Have fun working on the design and create something that suits your style. Now it’s time to ensure your store is ready to sell, we’ve designed a checklist to help you do just that. Spocket Settings - There are a few options to modify here. In the "Branded Invoicing" section, you can modify the invoices that will be in the orders packages. You can even add your logo to the invoices. Domain - it’s important your store can easily be accessed and purchasing a domain is much more inviting than using a yourshopname.myshopify.com address. Domains can be purchased directly from Shopify or an outside third party, we’d recommend Name.com but there are plenty to choose from. Payment Settings - You’ll need to change how you accept payments on your store, whether you choose to use Shopify Payments, a third party gateway or simply just Paypal, configuring these is a must. Shipping Settings - Here you’ll want to compare the shipping cost for Domestic and International with Spocket and create shipping rules to match in order to ensure you’re not losing money on shipping. A bit more about Spocket shipping cost here. Feel free to play around with the General settings on your store, as well as your online store preferences, then pat yourself on the back because your store is ready to sell! Join our 10,000+ member facebook group, share your shop, start sending it to friends, family and be on the lookout for our next blog post where we teach you how to market your shiny new store! If you have any questions, you can find help here.